We can’t afford to strand a field tech three hours away from the office. Our 2012 Dodge Grand Caravan has a well earned 140,000 miles on it and we’re concerned about the coming costs to keep it working reliably. It’s time to replace Traffic Data Inc’s mini-van with a new work vehicle. The default decision would be to get a van, mini-van, or Ford Transit; but we decided to pause and think through what we need. Surprisingly, we decided we don’t need as much cargo space to carry a days’ worth of wayCOUNT tube counting gear or CountCam video camera equipment. Our gear has shrunk by 50% over the last six years! I was inspired by Mr. Money Mustache to consider a Nissan Leaf. We have free electric charging stations in our office parking ramp where we store the work vehicle. I like the environmental aspects of going green and tapping into the innovation happening in our industry. Plus, it’s hard to beat free fuel! The 151 mile range of the all electric Nissan Leaf would cover more than 95% of our work days. Plus public charging stations are commonplace so we’d be able to charge up while grabbing lunch during our long days doing setups out of town. I was ready for us to do a test drive when Chris in the office brought up the Achilles heel of an all electric vehicle in Minnesota – what’s the range of the vehicle in bitter cold temperatures while a flashing beacon is running off the battery? We decided the range could be cut in half in our extreme climate/use. That’s a deal breaker for us. So, what about a hybrid? We looked into all of the options and settled on the Chevy Volt hatch back sedan. It goes 53 miles in all electric mode and a total of 420 miles when using the gas engine. We estimate we’d be able to do 75% of our work does in all electric mode and we like the backup of the gas engine to cover us on cold and/or long field days. I also like that the Chevy Volt has been on the market for years and is rated as being very reliable. We also decided to lease instead of buy. A three-year lease allows us to hedge in case we didn’t like to electric aspect or it proved to be too small. The three year lease with 12,000 miles per year costs about $375 a month. That includes the protection plan so we can turn it in stained and scratched (definitely needed!). We estimate we’ll save about $120 a month in gas per month plus we won’t have to spend the time/money on oil changes. We’ll take the vehicle in once a year for maintenance that’s included in the lease cost. The Volt’s fun to drive compared to a mini-van. Plus it’s so quiet. The hatchback gives easy access to everything. Having less extra space means we don’t waste it. We bring the gear into the office every day with one or two wagon trips, although we wouldn’t necessarily have to. Bringing everything in has made sure the work vehicle is clean and we don’t leave broken gear in it. This process ensures we bring ample working gear every day for the amount of field setups we have to do. The electric charging in our office parking ramp has caused us to skip going to the gas station once or twice a week. Though we occasionally still need to find a gas station for a restroom. Or a corn dog. Our next work vehicle just needs a bathroom in the back and a toaster oven and we will be all set! 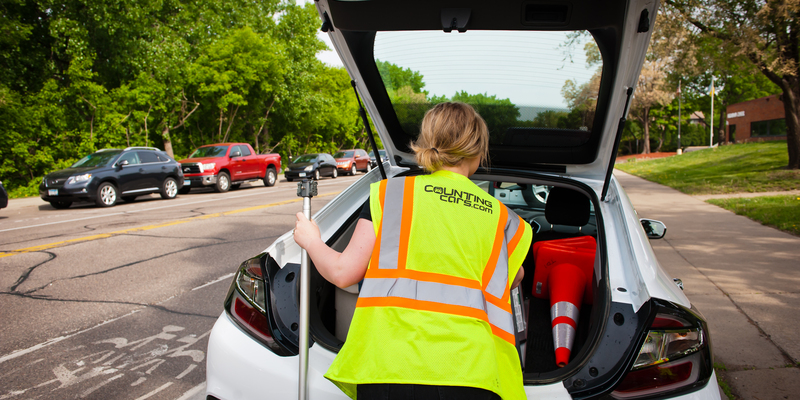 We wouldn’t have been able to switch to a Volt with our old Jamar, MetroCount and Miovision gear, but our tiny wayCounts and CountCams make it possible to do 40 setups out of a sedan. Overall, the Volt has been working great for us and I recommend you check one out if you need to replace your traffic counting van. Electric vehicles should be incorporated completely to everyday public and private sector service, the efficiency is crazy compared to gas powered vehicles. Great to hear you went to an EV hybrid. We also recently chose to buy a Nissan Leaf though as you mentioned, the range is quite limiting. We generally hire out large scale counting jobs and keep the smaller local contracts in-house. I love how the Leaf drives and am now converted to Ev’s for good. I would be curious to see if you guys notice any battery degradation over the lease of your Volt. To me, electric cars are the way to go. It doesn’t just help the environment, which is very important but, it also helps your pocket. Not a fan of electric cars, but they’ve really made strides these years. This has been one of my favorite cars they have released by far.